Vivo V15 Pro Key Specifications Leaked Well Ahead of Launch - Playfuldroid! The Vivo V15 Pro is scheduled to go official on Feb. 20 in India. A recent leak had revealed that the Chinese manufacturer will be launching the Vivo V15 smartphone alongside the Vivo V15 Pro smartphone in India. The company is expected to carry out the pre-orders of the Vivo V15 Pro in India on Feb. 15. 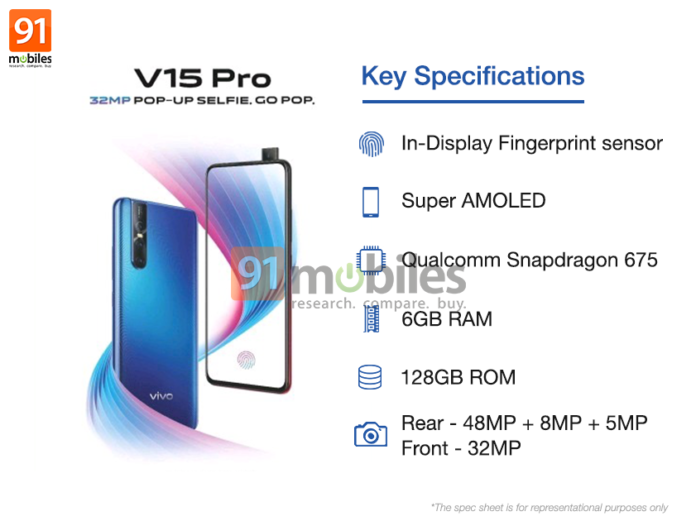 A leaked poster of the V15 Pro has surfaced today through which key specs of the phone have been revealed. The V15 Pro will be equipped with a Super AMOLED screen. The size of the display is not known yet, but what’s revealed is that it will be featuring an in-screen fingerprint reader. The Snapdragon 675 will be present under the hood of the device along with 6 GB of RAM. It will be packed with an internal storage of 128 GB. On the rear side of the phone is a triple camera setup that includes 48-megapixel, 8-megapixel and 5-megpixel sensors. For capturing selfies, it will possess a pop-up front-facing camera of 32-megapixel. There is no fresh leak available on the price tag of the V15 Pro. In India, the smartphone could be priced between Rs. 25,000 and Rs. 30,000. There is no fresh details on the specs of the Vivo V15 smartphone. It is speculated that it will be also equipped with a pop-up selfie shooter.